Mike Ashley – PR star? Sometimes listening to captains of industry being interviewed can be a yawn-inducing experience. They’ve been media-trained to within an inch of their lives and appear to have been sent off with a stern warning that anything they say will immediately impact their stock price/company survival/job prospects. The result? Cagey, bland and message-filled interviews that don’t get across their personality or that of the brand that they represent. Of course, there are exceptions who engage with the audience while still getting their message across, but for many, fear of failure stops anything interesting being said. As a PR person I find this really frustrating, as it is a missed opportunity to communicate. Another case entirely is Mike Ashley of Sports Direct, who has combined an appetite for controversy with not caring about speaking to the media. Given his reputation for frank speaking I can see why his PR handlers have kept him out of the limelight, so like many I was expecting fireworks when he appeared in front of House of Commons Select Committee to discuss working conditions at his Shirebrook warehouse. However, I was surprised at what I heard. Rather than bluster and defensiveness he admitted past mistakes, such as not paying the minimum wage, and said that the company’s size meant that it had probably outgrown his ability to run it. And all this after previously stating that he wouldn’t appear at the session and that if they wanted to speak to him, he’d send his helicopter to ferry MPs to his company HQ for an interview. So what caused this road to Damascus moment? I think partly it was the realisation that, like O’Leary, being hated by your customers and the public isn’t a long term business strategy. Competition is fierce in the retail market, and while many shoppers may not care about the working conditions behind their cheap trainers, others do. There is such a thing as bad publicity – stories about a female member of staff giving birth in the Shirebrook toilets as she didn’t want to call in sick and risk her job is bound to resonate widely with many people. By admitting errors and saying that the company was going to change he’s now one step ahead of his critics, though the focus will be on him to deliver on his promises. Another reason was that his actions give him the chance to occupy the retail moral high ground, given the ongoing investigation into the collapse of BHS, which has also seen leading figures in front of parliamentary committees this week. Former boss Dominic Chappell (who bought the business for a pound from Sir Philip Green), was accused of “having his fingers in the till” by one of his associates, described as a “Premier League liar” and of threatening to kill the chief executive after he challenged him on his behaviour. In turn Chappell’s testimony tried to shift the blame to Green, who he claimed had bankrolled his purchase (with more than a pound), and was behind the decision to put the chain into administration. Green will now get the chance to defend himself in front of the committee, so expect more mudslinging. Given his contrition it all makes Ashley look like a paragon of virtue – something that may help fulfil his desire to buy BHS in some form. For anyone talking to the media, they should keep these examples front of mind. Develop your own style, tailor it to the audience in order to engage with them, and take the time to go beyond the pre-written message if you want to be remembered for the right reasons. Whether you are Michael O’Leary, Mike Ashley or just talking to your trade press, invest time in the interview and you (and your company) will reap the benefits going forward. Like a lot of people I’ve been impressed by the current easyJet TV ads. Celebrating ‘generation easyJet’, the group of travellers that the airline claims was created due to its low fares and wide range of destinations, it is modern, engaging and aspirational. There’s no overt mention of price (in contrast to Ryanair’s pile them high and sell them cheap advertising), and the overall approach is grown up and comparable to ‘proper’ airlines. The message is travel with easyJet to do the things you love. However in an age of social media and consumer activism advertising can’t trump reality. Two recent easyJet blunders threaten to undo the slick ads, damage its brand and put off prospective passengers. Firstly, it initially refused to let a passenger who criticised it on Twitter board his flight. Lawyer Mark Leiser sent a tweet after his plane from Glasgow to London was delayed, potentially preventing a soldier on his way to active service reaching his base in Portsmouth. easyJet allegedly said they wouldn’t help pay for him to get to his destination. After tweeting Leiser was pulled out of the boarding queue and told by a manager that he couldn’t get on the plane as ‘you can’t tweet stuff like that and get on an easyJet flight.’ It was only when the manager found out that Leiser was a lawyer that they changed their mind and let him on. 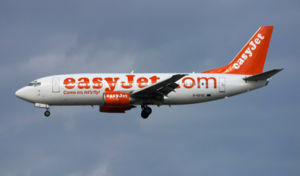 easyJet later apologised and denied that it was its policy to ban passengers based on what they’d said. However by then the damage was done as Leiser’s original tweets were shared around the world and then picked up by major media. A couple of weeks later easyJet managed to leave 29 passengers behind even though they’d passed through the boarding gate and completed check-in (and had hold luggage on the plane). Interestingly statistics from YouGov found that nearly 10% of UK Twitter users heard about the story, showing the power of social media to spread bad news. easyJet has invested over £5m in its new ad campaign and I’m sure BA has spent a lot more. But it looks like a classic case of being distracted by shiny things. A much smaller investment in social media and staff training might not look as impressive, but in today’s world may well go a lot further. Disobeying the cardinal rules of marketing and abusing your customers never normally works – remember Gerard Ratner describing his jewellery as ‘crap’? Particularly given that the Facebook campaign had gained support from over 500,000 users it seems to demonstrate that Ryanair is ignoring the power of social media to spread complaints and criticism. But it actually reflects Ryanair’s very simple brand proposition – cheap, no-frills flights with all the extras charged for (remember O’Leary’s threat to charge for using the loo on his planes?). Extreme, yes, and in many cases comes across as unfair, particularly when charges are added on that can’t be avoided, but in general people know what they are getting. It’s a classic case of market segmentation, coupled with a flair for hitting the headlines on a regular basis to reinforce the message. People can choose to fly through other carriers so there’s no monopoly that needs to be regulated which means that generally Ryanair can get away with it. So what lessons can we learn as tech marketers? Firstly, you have to be very focused on what your company/product/technology stands for. Build a unique proposition that solves a customer pain point and make sure that it runs through everything that you do. While it is always best to be liked by your customers, if what you are offering is compelling enough they will continue to buy from you. Yes, O’Leary is a motormouth but he knows exactly the value that his outbursts will bring in terms of column inches. These are not off the cuff remarks but a planned campaign to reinforce Ryanair’s proposition and keep it front of mind with potential passengers. Companies are generally faceless, so make sure you have a charismatic spokesperson to get your message across. Again, O’Leary’s positioning isn’t going to work for most businesses, but he provides an instantly recognisable face to Ryanair. Don’t use too many spokespeople, make sure they are media trained but let them demonstrate their personality and how it reflects the business. This should be easy for tech entrepreneurs who’ve put their lives into a startup, but getting them to look up from their technology to engage at a higher level can be a struggle. Given it claims to offer the lowest fares and operates as a no-frills company, you may think that Ryanair has a minimal marketing budget. On the contrary, over its last financial quarter Ryanair increased marketing spend six fold (to over €51 million). While that’s not going on social media it is going on eyecatching adverts designed to persuade passengers onto new routes with what appear to be compelling offers. The company knows that a combination of its brand presence, O’Leary outbursts and advertising through channels that reach its customers will translate into sales. No waste, no free iPhone apps, just a focus on what is proven to work. Clearly, very few businesses, tech or otherwise, can get away with how Ryanair markets itself and survive. But strip off the O’Leary bluster and there are lessons that can be learnt by all companies when it comes to successfully reaching customers and making money.